Custom Tarps made to order in about 5 days. Enter dimension in decimal feet. Roll tarp systems are commonly used on open top trailers with either a belly dump, end dump, or walking floor feature. They can also be found on roll off containers, grain wagon carts, fertilizer spreaders, and tender boxes. 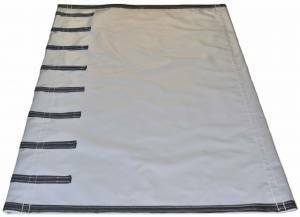 Side roll tarps can be manual or electric and use a pair of pipes to secure the tarp as well as open it from side to side. Most roll systems include a metal front nose cap for the tarp to overlap and belly dump trailers typically have one in the rear as well. Tarp width is the side to side measurement and is a calculation of trailer width, plus any extra arch added by bows, plus many roll systems require a foot of travel to lock in place. 9.5', 10', and 10.5' are the most popular widths. Tarp length is the end to end measurement. Metal front caps typically have a raised tab to indicate where the tarp should start. Measure from this point to this same tab at the rear of the trailer to learn the length needed. In the event your trailer does not have these tabs plan for at least 6" of overlap at each end. 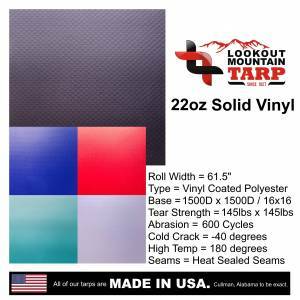 This replacement roll tarp is built using 22-ounce vinyl coated polyester which is our most popular and most durable fabric for roll tarps. The material is completely waterproof making it a perfect choice for loads like grain that need to stay dry. 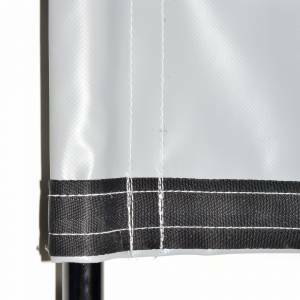 22oz fabric has thicker vinyl coating with a 33% higher abrasion helping to reduce down time between tarp changes. 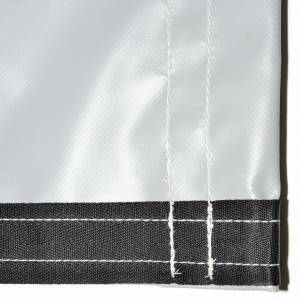 Inside the fabric are additional yarns that boost the tear strength by over 30%. This higher tear strength is especially important on electric systems. 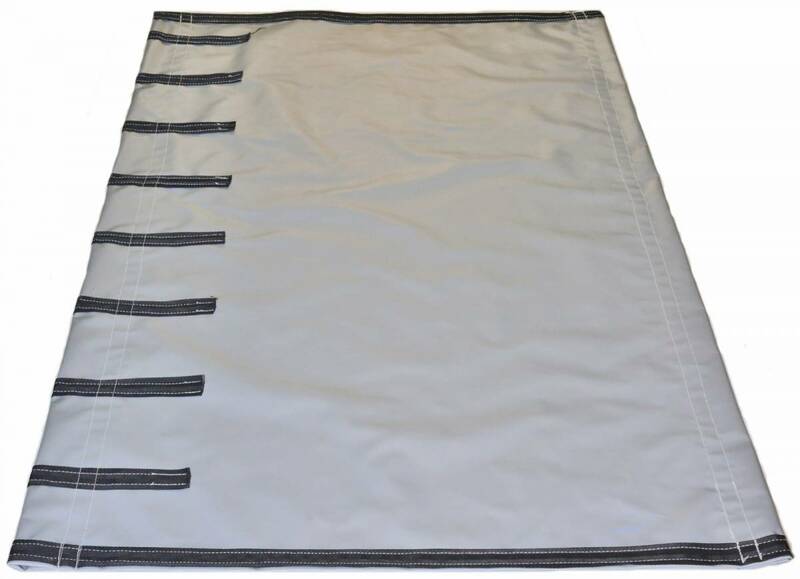 Our standard roll tarp design has a rectangular shape. 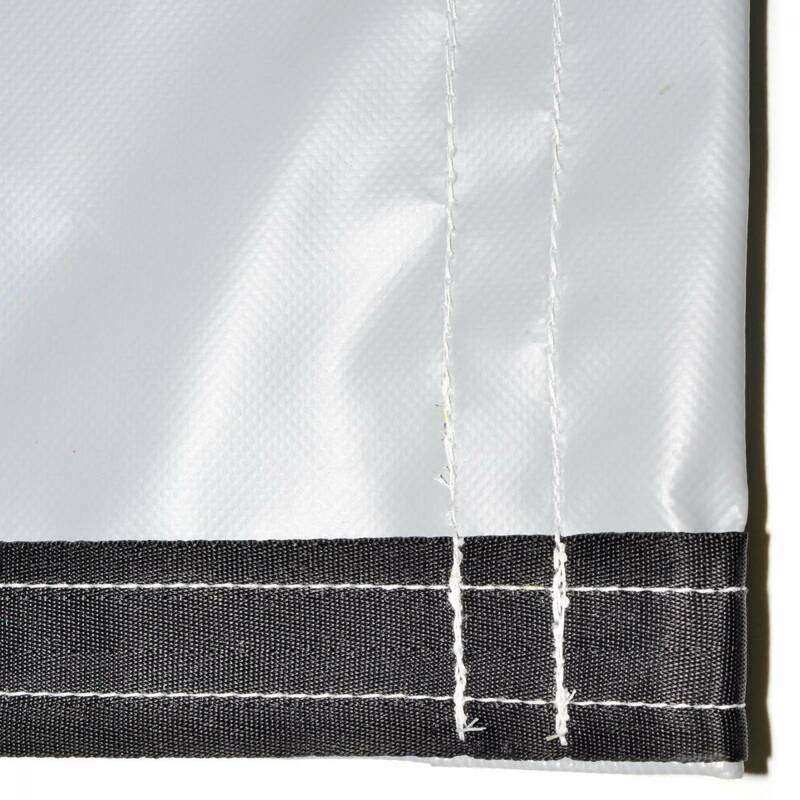 The leading edge is folded over creating a 2-ply thickness known as the hem. 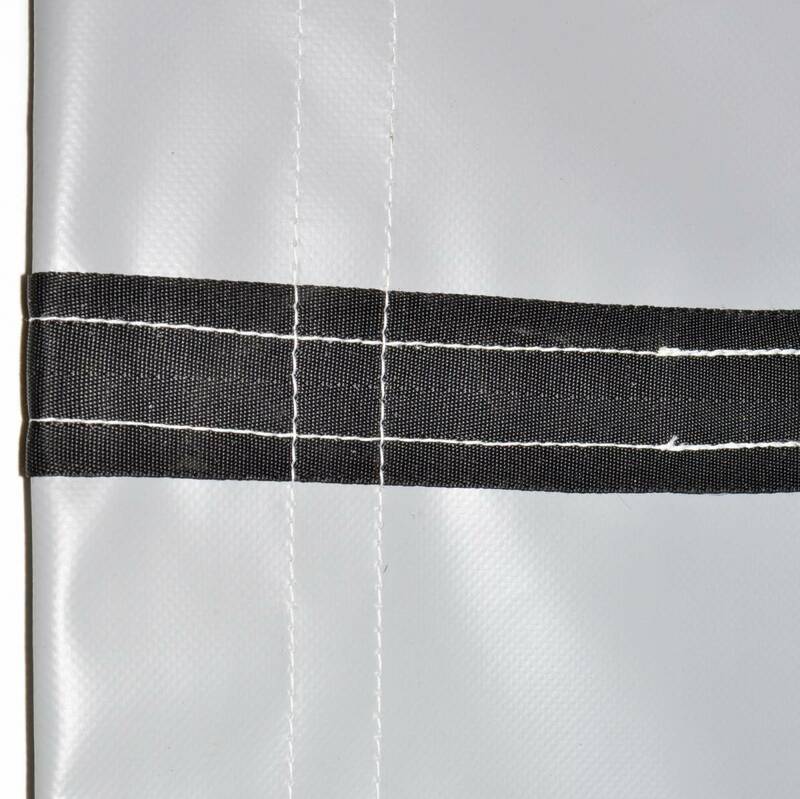 Seat belt style webbing is installed to the top side of this hem boosting its tear strength by 800 LBS. 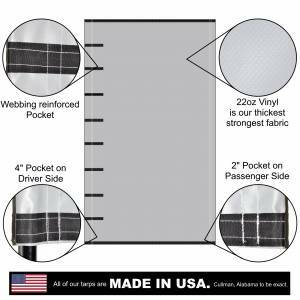 The passenger side of the tarp is folded over to create a pocket large enough for the 1" stationary pipe to slide through. 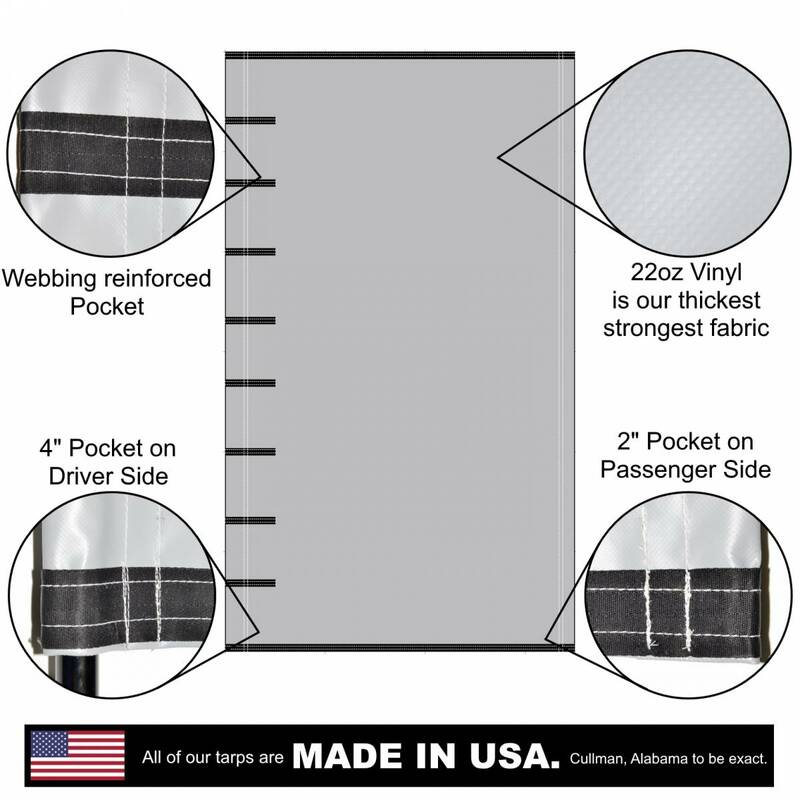 The driver side pocket is large enough to hold a 2" pipe and is reinforced using 18" strips of webbing. 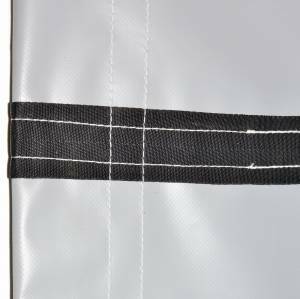 We use a heavy duty 277 polyester bonded thread sewn in a double lock stitch that has been tested to outperform welded pockets. Copyright © 2019 Lookout Mountain Tarp. All Rights Reserved.